Time to share my piece I made for the Queensland Quilters challenge. The quilt had to fit the theme 25, as Queensland Quilters is celebrating it's 25th birthday. So I did 25 daisies. 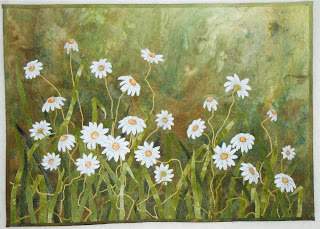 I had taken photos of some daisies growing wild that I came across in my travels many years ago, and had the images stored away for the right moment to use them as inspiration for a work of art. This piece has a painted background, with hand dyed fabrics used for the leafy bits, and some yarns couched down for the stalks. The daisies were machine appliqued and I used whip stitch for their centres. It was all stitched together with monopoly, which is a bit tricky in the photographing phase as it really reflects the flashlight and goes all shiny. The exhibition opening was last night, and prior I had a fabulous meal with Kate and my dearest friend Karen, at a turkish restaurant. Delicious! There was some beautiful textiles hanging about the restaurant, so it was very fitting. After that we moved on to the exhibition, which was terriffic, superbly organised and the quilts were hung beautifully. Congrats to those that won prizes in the challenge, they were well deserved. Great work, Bernadine. And thanks for your helpful advice about stsitching on Surfacing.